This month marks the near completion of two solar gardens by Enercore and SunEdison located in Foxborough and Hopkinton, Massachusetts. SunEdison is currently building solar gardens all across Massachusetts, with the town of Foxborough hosting the first 2.7 megawatt project. "Community solar is a game changer," said William Keegan, Foxborough's town manager. "By going solar, we're saving taxpayers money and bringing economic activity and cleaner air to the community." 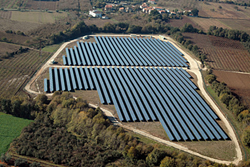 Community solar, or a solar garden, is a solar electric array that has multiple subscribers who connect to one utility grid. Think of a community garden. In a community garden, participants share patches of land for gardening purposes. A solar garden has a similar concept, although subscribers purchase/lease panels in a particular array, and receive a credit on their electric bill for the power those panels produce. Community solar in Hopkinton and Foxborough is currently being offered to residences, local businesses, non-profits, and other organizations. Community solar is ideal for individuals who may lease a property, and are unable to install rooftop solar. Community solar allows for every individual to have access to solar energy. The community solar garden in Foxborough is expected to generate enough energy to supply more than 320 homes with energy. This solar garden eliminates the emission of more than five million pounds of carbon dioxide a year. This is the equivalent of taking roughly 500 cars off the road in a year. Homeowners can currently receive up to a 10 percent discount on their utility bill when they sign up for an array in the solar gardens of Foxborough or Hopkinton. Some counties that can currently benefit from the use of the solar garden in Foxborough are Bristol, Barnstable, Worcester, Norfolk, Plymouth, and Nantucket. "Community solar is a game changer," said William Keegan, Foxborough's town manager. "By going solar, we're saving taxpayers money and bringing economic activity and cleaner air to the community. We are pleased to be able to partner with SunEdison as they enter the Massachusetts community solar market." Enercore, in conjunction with SunEdison, will begin building and selling community solar projects throughout the great state of Massachusetts starting as early as March. The towns of Kingston, Haverhill, Spencer, East Hampton, and Holland are just a few of the places that will benefit from the building of community solar gardens. Each solar garden will be able to service numerous counties, in that area, with solar energy. For more information on Enercore’s current and upcoming community solar projects, please visit our website.